Can not eating be good medicine? It is the season of Lent, and while many people fast during this time for spiritual reasons, why not do something positive for your body as well as your spirit? Fasting is actually considered one of the oldest prescriptions for good health. But note, fasting is not the same thing as starving. Starvation is the involuntary absence of food. It is neither deliberate nor controlled. Fasting, on the other hand, is voluntarily withholding food for spiritual, health, or other reasons. It is the difference between suicide and dying of old age. The two terms should never be confused with each other. 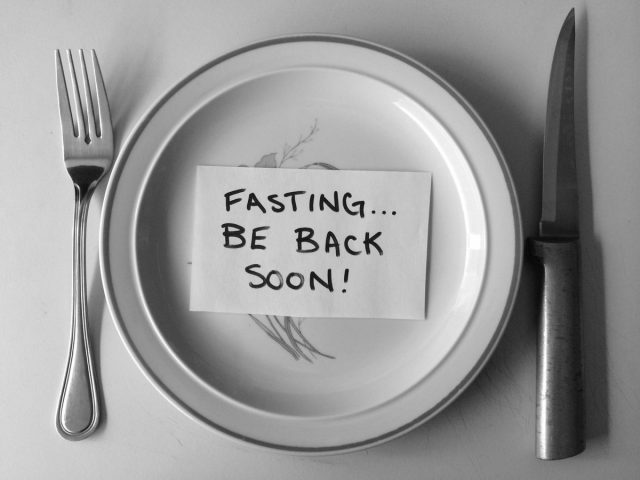 Fasting may be done for any period of time, from a few hours, to months on end. In a sense, fasting is part of everyday life. The term ‘breakfast’ is named as such because it’s the meal that breaks the fast after several hours of sleep – which is done daily. The ancient Greeks believed that fasting improved cognitive abilities. Think about the last time you ate a huge Thanksgiving meal. Did you feel more energetic and mentally alert afterwards? Or, instead, did you feel sleepy and a little dopey? More likely the latter. Blood is shunted to your digestive system to cope with the huge influx of food, leaving less blood going to the brain. This results in that well-known feeling brain fog. Fasting for spiritual purposes is widely practiced and remains part of virtually every major religion in the world. Jesus Christ, Buddha and the prophet Muhammed all shared a common belief in the healing power of fasting. In spiritual terms, it is often known for cleansing or purification, but practically, it amounts to the same thing. The practice of fasting developed independently among different religions and cultures, not as something that was harmful, but something that was deeply, intrinsically beneficial to the human body and spirit. But does this fasting cause your metabolism to slow down? Unlike calorie restrictive dieting, fasting for short periods has no lasting effects on the basal metabolic rate. (To read about the damage that calorie restriction diets do, CLICK HERE to see what it did to the ‘Biggest Loser’ contestants). As a matter of fact, short term fasts actually rev up your metabolism between 3.6 and 10%! “We say that fasting is very similar to rebooting the hard drive in a computer. Sometimes, the computer gets corrupted, and you do not know exactly where the problem is. But if you just turn it off and reboot it, a lot of times, that corruption gets cleared out,” says Dr. Alan Goldhamer, researcher on a study on fasting. A host of positive things start to happen in the body when you take a break from eating. People often think it’s just calorie restriction, but the changes at the hormonal level are more important. When you eat, your body releases insulin. Shutting off the insulin supply keeps the body from manufacturing fat. When you use up the sugar stored in your body, the body shifts over to burning fat. Simple calorie restriction won’t accomplish this. Autophagy is the powerful force where the body starts eating weak and damaged cells. It’s the body’s way of doing spring cleaning. In 2016, Japanese scientist Yoshinori Ohsumi won the Nobel Prize for his discoveries into the mechanisms of autophagy. These have led to a better understanding of diseases such as Parkinson’s and dementia. The single best way to utilize autophagy in your body is to fast for 24-36 hours. There are no drugs that can encourage autophagy better than simply not eating. If you are fasting for spiritual reasons, why not enjoy the benefit of doing some positive things for your health at the same time?